New Faces and Top Banana opened on the same winter day in New York, and both of them reflected the sudden prominence of television—the latter as setting for its story, the former as TV’s new dominant format. By 1954 the Bway revue had been appropriated almost entirely by the new free medium—and with weekly fresh editions headed by Berle, Caesar, Coca, Gleason, and dozens of lesser lights what chance had the genre to survive on Bway? Revues are mostly pot luck; a meal of many plates, ranging in quality and taste with no discernible continuity. The better ones have a theme, or a star or two to feature in carefully tailored material. Two recent attempts: Two on the Aisle with Bert Lahr & Dolores Gray; and Two’s Company with Bette Davis (both bolstered with superior writing talent) attested to the format’s fading popularity—at least at orchestra prices. New Faces of 1952 gave brief hope for its revival, but it proved the last hit revue on Bway (except for the one-of-a-kind French lunacy, La Plume de Ma Tante, at the end of the ‘50s) until the songwriter anthology came into vogue decades later. 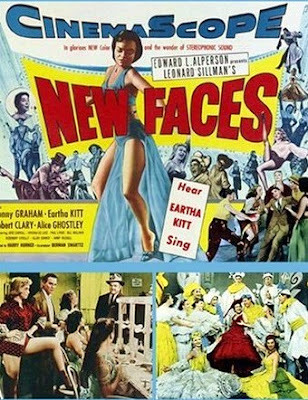 New Faces was considered the last of Bway’s “great revues,” a tradition that saw peaks of brilliance in the ‘30s & ‘40s, mostly thru the contributions of America’s best tunesmiths: the Gershwins, Arlen, Berlin, Dietz & Schwartz. Arriving at the lowest point of the musical drought on Bway in May 1952, the show played a year in New York, then over half a year in Chicago. At which point the company shipped out to Hlwd and filmed the movie in a quick 3 weeks, before hitting the road for another 18 (half of them in San Francisco) prior to closing shop. There’s a lot of faces in the filmed New Faces but only a handful get a chance to leave an impression: Eartha Kitt, Robert Clary, Paul Lynde, Alice Ghostley, June Carroll & Ronny Graham. The other 14 players are relegated to bits and chorus roles. Carol Lawrence shows up in dance numbers and demonstrates enuf talent to catch Jerome Robbins’ eye a few years later. But truth to tell would I have thought as much of her if I didn’t know who she was? Since the show’s debut in ‘52, the biggest breakout was Eartha Kitt, who was quickly making records on her own. Fox made sure to capitalize on that, inserting 3 of her recent hits into the film that had never been part of the show. The first comes almost immediately, “C’est si Bon,” establishing la Kitt’s French pretensions. The second was a Turkish folk tune, “Uska Dara”—your guess is as good as mine. And the third was her signature song, “Santa, Baby” which in the previous year became a Christmas sensation and her calling card to most of the general public. I still can’t put my finger on it, but I’ve never been seduced by this so-called feline seductress. I’ve always found her slightly creepy (too big a head? too petite?) and here when she sings her biggest hit from the show itself, “Monotonous” the way her arms fly above and about her seem no less exaggerated than the extremes Lypsinka makes hilarious in her drag breakdowns. And what’s with the Material Girl thread? Here she’s bored with the world thrown at her feet; in “Santa” she asks for little trinkets like diamond mines! Kitt’s voice, in its husky, guttural “purr” recalls Piaf, which I’ve found to be an equally acquired taste. The other Frenchman in the show—the real one: Robert Clary—is a pint-sized singer, in the Joel Grey manner. Known mostly in later years from “Hogan’s Heroes,” here he bellows each song in the Gallic music-hall manner, which means you will like him depending on your tolerance for such a foghorn style. He also gets one new number, the traditional “Aloutette” (just to prove to us he’s French?) which feels like a preview of La Plume de Ma Tante. But the best of his lot, tho admittedly hammy, is something called “Raining Memories,” sung in a field of open umbrellas—which in its simplicity is a visual highlight. Mercifully, New Faces doesn’t make the mistake of playing to a silent audience as Top Banana did. The scenes are unmistakably stagey, but at least they feel performed for us “faces in the dark,” as Norma Desmond would say. It’s obvious that each segment was filmed separately, with the expectation and result of being shuffled about (the order of sequence differs greatly from the Bway show), so there’s no real sense of flow It’s pot luck. As an artifact from a forgotten age this is a great document, but as a timeless piece of entertainment: the milk in this carton has mostly turned.